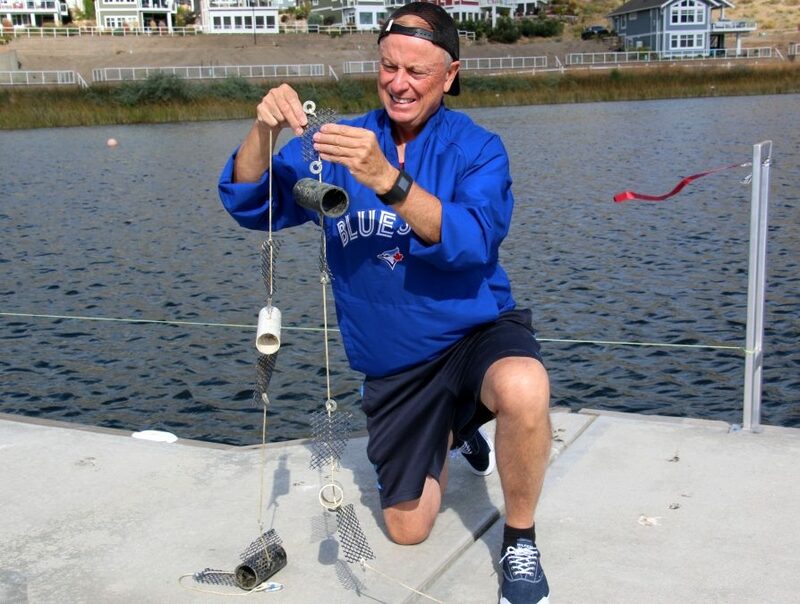 In addition to the Osoyoos Lake Water Quality Society’s pursuit of invasive Zebra and Quagga mussels, like-minded residents on Osoyoos Lake have taken up the cause of monitoring for invasive mussels with monitoring stations provided by OASISS (Okanagan and Similkameen Invasive Species Society). This monitoring station at the Osoyoos Cottages Marina (think artificial reef) is being used to trap Zebra and Quagga mussel larvae. Every station on the lake is closely monitored for any signs of something growing on either the PVC pipe or the mesh filter. All findings are identified and sent to Oasiss for further testing and evaluation. So far, nothing suspicious has been detected at this station.